What can you bundle, organize, tie or store up? Our 3″ reusable Gear Ties have as many uses as you can dream up! With a soft rubber exterior that is colorful, UV resistant and holds shape, our reusable ties are cable ties, cord organizers and more, for home, office, garage, boat, or anywhere else that needs organization. 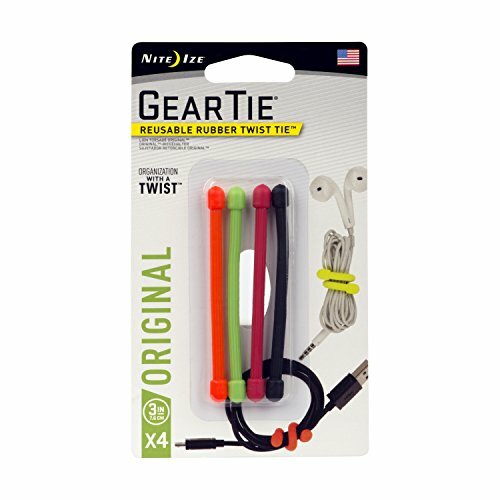 Available in a range of colors, these rubber twist ties work great as cable ties or cord organizers that add a punch of color, and help you stay organized with color-coding. A strong internal wire and soft rubber exterior makes for a durable, UV resistant, reusable, waterproof gear tie that holds shape and provides excellent grip. Reusable, bendable ties can be used as cable ties, cord organizers, rubber twist ties for headphones, for closing produce, snack and goodie bags, shoring up plant and flower stems and more, all with a simple twist. 3″ Gear Ties have a soft rubber exterior that won’t scratch, mark or ding. Each measures a functional 3″ x .24″ x .24″ and weighs a mere .07 oz. CONVENIENT 4 PACK – This convenient 4 pack gives you enough gear ties to manage your desk, drawers, tool box, or any other space that needs organizing. REUSABLE RUBBER TWIST TIES – Our 3″ Gear Ties have a soft rubber exterior that is colorful, UV resistant, and holds shape. The perfect all-around organizer for home, office, travel and more. MULTI-PURPOSE – Reusable, bendable ties can be used as cable ties, cord organizers, rubber twist ties for headphones, for closing produce, snack and goodie bags, shoring up plant and flower stems and more, all with a simple twist. DURABLE AND WATERPROOF – A Strong internal wire and soft rubber exterior makes for a durable, UV resistant, reusable, waterproof Gear Tie that holds shape and provides excellent grip. It will even hold up to salt water! COLORFUL CABLE TIES – Use colorful 3″ Gear Ties as cable ties or cord organizers that add a punch of color, and also help you stay organized with color-coding. SAFE + SMART DESIGN – 3″ Gear Ties have a soft rubber exterior that won’t scratch, mark or ding. They are easily mountable to many objects. Each measures a functional 3″ x .24″ x .24″ and weighs a mere .07 oz.